This is your guide to buying your kid that beautiful acoustic guitar they’ve been asking for. There are a lot of guitars on the market, like really a lot that’s why it becomes hard to choose the right one. If you are also clueless then you’ve just come at the right place. Firstly, I’ll be giving a small review of the best acoustic guitars for kids and then I will share some basic knowledge about choosing the right guitar and what to look for in a guitar. One of the smallest guitars by martin, this one is best for kids because of comfortable playability and rich tone. Kids can easily practice on this one. It is also very easy to carry. So, if you are thinking of sending your kids for those guitar lessons, then don’t think too much. This guitar is light weighted and the sides and back of the guitar made of mahogany. It does not sound like a full size guitar; still the sound is pretty unique. It has a tusq saddle and the tuners are small knob of chrome. With this you even get a small gig bag which makes it easier to carry it around. One of the best guitar for beginners or kids, as this one offers lightweight with a mellow tone. The guitar is inexpensive with back and sides of nato which is appreciable. This one has proved the myth wrong about acoustic guitars being expensive. The pick that comes with the guitar is of not that good quality but you can always buy a pick as they don’t cost much. This guitar is pretty solid and the sound quality is really great and well balanced. I would suggest this guitar to anyone who wants to buy an affordable guitar with great sound quality. Kids love these kinds of guitars because of their traditional looks and easy playability. 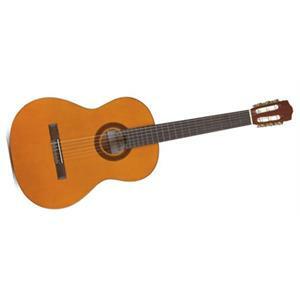 This is a Spanish-size guitar with a small body and nylon strings which is just perfect for kids. It looks attractive and a bit classy. It has rosewood bridges and fingerboards. It has a spruce top with sides and back of mahogany. It comes with a Cordoba bag. 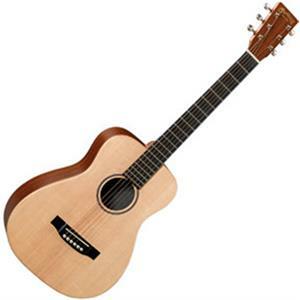 Overall, it is a comfortable guitar for young aspiring kids who want to learn guitar. This guitar offers prime savarez strings. And to ensure stability of the neck, it is made of truss rod. Kids love this kind of guitar because of this guitar being basic at a reasonable price. The only downside is the gig, which is padded with inferior quality padding. But overall it is a classic guitar for kids who are really interested in music. 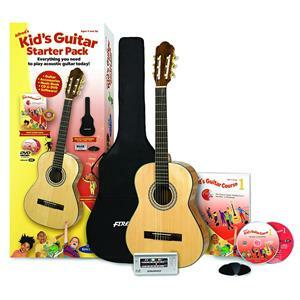 This is a complete package for kids who want to learn guitar. This pack from Alfred’s is revolutionary and one of the best. This is everything a kid needs. This guitar is ¾ the size of a classic acoustic guitar, which makes it easier for kids to play and learn. 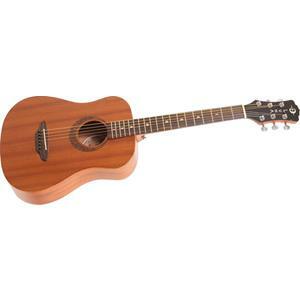 This acoustic guitar is very lightweight and comes with a gig bag to carry it easily. With guitar comes a colored-page book which offers the best course for kids to learn and also a CD with audio track. You also get a play-along the song player and a chord dictionary. This is a best-selling guitar, which helps kids worldwide to learn and practice guitar playing. In terms of looks, this guitar is beautiful and has a glossy finish. It is suitable for kids who are very young, as it provides them with the interactive software to learn easily. This is a great money-saving guitar suitable for traveling. This guitar is made of mahogany at top, sides, and back. Around the sound holes, Celtic laser printing has been done. This guitar is actually half the cost of Taylors and other brands without any compromise in the sound quality. If you are looking for a small, light guitar with which you can go camping or perform at small gigs then this guitar is the bomb. The sound of this guitar has the depth which can be compared to the average size guitar. Since you are buying the guitar for kids so trust me when I say that this guitar is best for the kids. It is light-weight, great quality, no extra glue, great sound and easy to play and last but not least; it is very affordable. This guitar is an amazing choice for kids. It is made for those with small hands, which make it easier for kids to play it. The designing and the craftsmanship is just stunning. 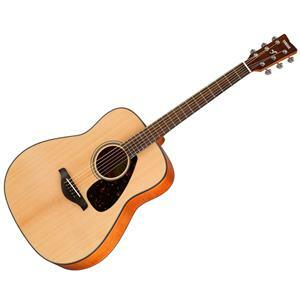 It is a beautiful guitar with spruce top and a truss rod, which is fully adjustable. The best part is that, you also get a warranty with the guitar. Having a small size, this guitar offers great sound with balanced tones. This is compact and lightweight guitar. But it is hard to guess if the wood pattern on the body of the guitar is real or not and the fret board is very small which makes it easy only for kids and people with small hands but for an adult with average size hands, it is troublesome. Overall, this is a great deal for your kids and is also very affordable. This one is very much playable for kids because of its small size. With small profile, this guitar also has nice tone that your kids will surely love. This guitar has a rosewood fretboard and a maple neck. The strings used in the guitar are martin strings which is great for a guitar with a price so low. Overall, it is the best deal for your kids if they want a small fancy guitar. This guitar comes in five different colors. It is a fun and easy to play guitar with great audio and consistency. The only downside is that this guitar needs constant tuning. Apart from that, it is great for kids to practice or perform in school bands or recording. This is a not very expensive guitar, which can actually develop your kid’s interest in music. With this guitar, your kids can really enjoy the tone of an average acoustic guitar (full size). As it is a bit difficult for kids to play big guitars that’s why the size of this guitar is just perfect for them. It has a mahogany body and a spruce top. It gives a deep sound which is very much appreciable. The size is so compact that kids can play it with their small hands and also this guitar can become a travel companion. This guitar is very much fun to practice with and is the same size as of Taylors; only cheaper. This guitar also comes with a case which is actually a plus point to the guitar. The guitar is good for your kid if he/she is a beginner. This is a great deal under a hundred dollars. The size of this guitar is such that it is very easy to hold. The quality of the sound of this guitar is pretty good too. If you have a really low budget and want to buy a good guitar, then this is the one. The fingerboard of this guitar is smooth and so is the bridge. In terms of looks, this guitar has a very basic look with a spruce top and the sides are made of nato. It also has good nylon strings. But you have to tune the guitar more often which is expected from cheap guitars but for beginners it is normal and shouldn’t be a problem. For kids, the sound is loud enough for them to practice and learn. I would say that this guitar is money saving guitar with great sound quality and easy playability for kids. 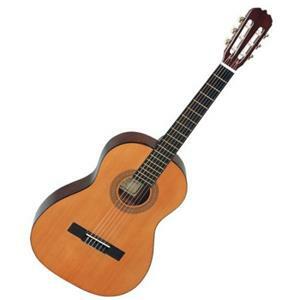 This guitar offers ease for your kids to play as it has nylon strings and compact size. It is perfect for beginner kids as it also offer maple fingerboard and top, sides, and back is made of basewood. The overall look of this guitar is very classic. It also has a glossy look that makes it beautiful. In terms of sound, the quality is enough for kids to play. Even under this price, this guitar’s sound quality can be compared to a full size guitar. I would say that this guitar is okay for learning as a beginner, but as an intermediate, you might want to upgrade to a better one. Look, if you want to buy an acoustic guitar for kids them remember that the kids are small, so they can’t handle a full size guitar. That’s why you can look for a ¾ size dreadnought guitar or similar kind of small guitar which are light in weight. Also, the neck should have easy playability with light strings not the steel ones. The fact is that cheap acoustic guitars are usually the worst. Their sound is not good, the finishing of those guitars is poor. That’s why don’t go for those just because they are cheap. Always go for good quality when it comes to learning something new. The guitars mentioned above are the best under-budget guitars that you can go for. Their size is appropriate for the kids and the cost is pocket friendly and even you can use those guitars for family vacations or small gigs or even recordings. When it comes to this question, the answer differs in different cases. The size may vary from one child to another. Like, if a child is less than 6 years of age, then a ¼ size of guitar can be chosen, or if your child is less than 9 years of age, then a ¾ size is perfect and after 12 years, a child can manage a full-size guitar. So there is no specific answer to the question. If you can get advice from any expert about that then you should because you can’t find experts’ advice on internet easily. They can tell you what size of an instrument is suitable for your kid. Overall, it is just a guitar, what’s the worst thing that can happen? Some people also ask the question “at what age should we buy our kids a guitar?” There’s a simple answer to that question, “any age”. Yes! You can buy your kids a guitar at any age because it totally depends on their desire to learn the instrument. Don’t force it on them unless they really want to learn. There are some kids who start as early as 5. Look, if you feel that your kid loves guitar and serious about learning it, then you should definitely buy him/her a guitar. This way they can really learn a new skill and follow their passion. Also, their learning abilities will increase, which will also help them in their studies and all. Also remember to never buy a second-hand guitar or a used guitar because they can get easily damaged. There are many cheap guitars that I mentioned above which have great sound quality and are durable. You can’t depend on a used guitar as they have no guarantee of durability and playability. Used guitars can sometimes demotivate you. Newer the guitar the better, as a new guitar can really motivate you and there’s this excitement in you while using them. And trust me; no kid wants to use an old guitar. But if you’ve thought about buying an old one then make sure you know the person well and the guitar they are selling is damage free and is in excellent condition. First, we’ll talk about what they really are because not many people know that there are classical guitars too. An acoustic guitar is basically a hollow bodied guitar, which totally depends on the strings and body for sound. It doesn’t need any electric amplification. The body itself amplifies with the string vibrations. These guitars are the most basic and come in different prices. From cheap to extraordinarily expensive, these guitars are loved by every guitar enthusiast. But they are too basic. That’s why there are electric guitars. Electric guitars use pickup to use the vibrations from the strings and convert them into the electric signals. These guitars are really popular because of their use in many music videos and stage performances. With these guitars, you can manipulate the sound coming from the strings and even increase or decrease the volume. But there is one downside; these guitars don’t produce sounds that are loud enough to be heard by everyone in the room. But you can always connect them to an amplifier which amplifies the sound and sends it to the loudspeaker to play for a bigger crowd. Now, let’s talk about those classical guitars. You might have seen the guitars online or in stores, the guitars are made of wood and look exactly like an acoustic guitar but have nylon strings rather than the metal ones. These guitars are pretty fancy. They are easy to play and generally have 12 frets which are not in the case of modern acoustic guitars. They are good for the kids or beginners who want to learn guitars because they are soft on the fingers. And once you start to advance, then you can use the steel one. There’s also one thing that you can’t interchange the nylon strings of classical guitars with the steel ones. Since we know about the types of guitars, so let’s talk about which one to choose. Every kid has different choice. You can’t disappoint them by giving them a nylon guitar when they asked you for an electric one. So all you have to do is ask them what they want. If they are wise and have already thought about it, then respect their choice and buy them the one they want. And if not, then see their qualification and with the qualification I mean, if they are beginner, intermediate or expert. For beginners, a classical guitar is best. It is easy to learn and very smooth. But electric guitars are also good for learning and are pretty attractive. Your kid will develop a deep interest in the guitars by using an electric one. Don’t buy them a guitar which is very cheap and the sound is irritating or all over the place. Since we are talking about easy, so let’s discuss which one is easy, Acoustic or electric? For years, it has been a matter of discussion among the enthusiasts that which one is easy to use. You can never tell which is easier. If your kid or the beginner is motivated to use either acoustic or electric then that one is easier. If not, then everything is hard. 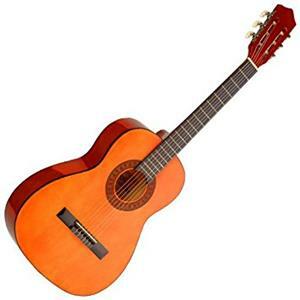 Classical guitars are very cheap and easy to learn that’s why they are recommended by many to the beginners. But the electric guitars are interesting, their strings are very light and you can control the volume of an electric guitar, which is not the case in acoustic and classical guitar. They are pretty loud and sometimes can become irritating for others nearby, electric guitars, on the other hand, have amplifiers which amp the sound and can be used to lower the volume or even connect with headsets. This gives the electric guitars an advantage. But at the end, it all depends on the kid’s choice. Go for the one that your kid is interested in. Some people think that there are different guitars for boys and girls, which isn’t true. Guitars are same for both the genders. That’s why you don’t have to buy that guitar with that tacky design just because you think it represents a gender. It is true that musical instruments can be really expensive and not everyone can afford a $500 guitar. That’s why there are many options under $100. 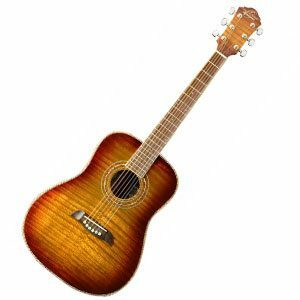 Acoustic guitars are usually less costly than the electric ones because of the accessories like amplifiers which come with electric guitars. Acoustic guitars can also be expensive. Remember, the more you spend on guitars or any other instruments, the better you get. But still, if your budget is less than or equal to $100 then there are many guitars out there. 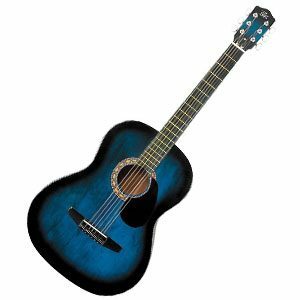 Some of the best cheap acoustic guitars are even mentioned above which can save you a lot of money. So, if your child is a beginner, then be ready to spend at least $100 because your kid can’t learn on a crappy guitar. Moreover, if you’ll buy a cheap guitar for your kid which has bad sound, then your kid will hate it and he/she won’t even touch it. So think before buying. You can either buy from your nearby musical instrument shop or you can buy online. Now let’s talk about the markets first. When buying from the market, you can always buy the best deal if you shop smartly. Many places are money minded, which means that they will try to sell you the crappiest guitar for a high price if they know that you are a beginner. So try to go to a trusted shop which has experts in it. If the shopkeeper can’t guide you then trust me, you are in the wrong shop. A good shop owner can help you by telling you what kind of guitar is suitable for you, or which one has the best strings and so on. Similarly, if you are buying online then always go for trusted websites and look for the reviews and return policy. Sometimes during delivery, the product gets damaged which generally happens in the case of bad websites. So, always look for the best websites which offer good deals. Guitar lessons are important for kids as it is not easy for kids to scout themselves into learning an instrument. A good teacher is needed who can at least teach them the basics. But many people get confused about whether to go for offline tuitions or the online ones. I would say that they both are same. If your kid is learning through Skype then it is equal to learning with a teacher in a room. Just look for the good reviews before starting their lessons. Beginners tend to go for the looks and designing of the guitar which is a mistake. That is the reason why many guitars with great sound are still hanging on the walls of the shops while the designer ones with crappy sound are out there making it hard for beginners to learn guitars and eventually they lose interest in them. Look, if you are thinking of re-selling the guitar, then you are probably giving it to a beginner then the looks of your guitar will work, but if you are giving it to someone who is having knowledge of guitars or is at intermediate level then you won’t get much for that kind of guitar because they tend to go for good sound quality. That’s why before judging the looks of the guitar, first check the sound of it. After talking about different types of guitar and how they work. You can now easily decide what you want to do. From setting up a budget to choosing the size, every guitar offers different service. Buying first guitar is like buying an experience which should last the lifetime. For kids, it can be a start of something big. If your kid is really passionate about guitars and knows what he/she wants, then it becomes easier to decide. Always respect your kid’s choice. If you buy them a guitar, which they don’t like then trust me, you are just wasting your money. A kid will tend to enjoy and learn something if he/she is motivated to do it every day and love doing it. For kids, all that matters is the size of the instrument and the size of the neck. If they can hold the neck of the guitar easily and the strings are smooth on their fingers then they can enjoy it. In the world of music, greatness comes to those who are passionate. If you really want to learn something new then nothing can stop you. Being a parent, you should guide your kids for their betterment. If they know what guitar or instrument they want then there is nothing to worry and if they don’t then the list mentioned above can be really helpful. You’ll learn more about an instrument if you use it regularly, that’s why practice every day because practice is the key to success and brings you closer to perfection.